Millions watched Shaun Livingston suffer one of the most gruesome injuries in NBA history — but the once-touted point guard is still in the league, and he isn’t ready to give up yet. More than 60 years ago, boot camp in the Marine Corps featured plenty of challenges like this. Like the time tear gas was tossed into his bunk just minutes after he learned how to properly operate a gas mask. The motto became the mind-set: Nothing’s impossible in the Corps. That same mentality helped Livingston as a father and a grandfather. And it aided him when he was diagnosed with colon cancer in 1995. He still worried that he would never see his grandson, Shaun, become the man he was supposed to be. He was already a prodigy, walking at 7 months and lugging books everywhere he went by 3. He would be a doctor, or maybe a lawyer, Livingston figured. Grandfather and grandson had formed a special bond, and from Frank’s lap, Shaun learned about integrity and resolve. It’s what carried Shaun Livingston when it happened. It’s easy to see now, with the Clippers standing tall as one of the league’s best teams. They showcase superstars Chris Paul and Blake Griffin, and a deep roster. But think back a few years earlier, to a time when another Clippers roster teased the NBA with fleeting respectability. Shaun Livingston, 20 years old and just two years removed from high school in Illinois, was all knees, elbows, and potential. That potential — vision, athleticism, tenacity — was never more evident than in the 2006 playoffs. The no. 6-seeded Clippers had won their first playoff series in 30 years, cruising past the Carmelo Anthony–led no. 3-seeded Denver Nuggets. Tied 2-2 in a series against the offensive juggernaut Phoenix Suns, the Clippers held the momentum, but not the home-court advantage. Elton Brand played like an MVP and Sam Cassell like the savvy veteran point guard he was. Livingston, his apprentice, was the 6-foot-7 playmaker destined to revolutionize the point guard position. He resembled Magic Johnson, the way he peeked over smaller guards and bounced around in his defensive assignments, holding his own against Steve Nash, Leandro Barbosa, and Raja Bell. “A beckoning player in this league, for sure,” Nash recalled recently. Brand, Cassell, Chris Kaman, and Corey Maggette formed the backbone of that Clippers team. But the future lay with Livingston. “Shaun would have definitely been the next All-Star coming up,” Brand said. Livingston, despite his quiet demeanor and a shaky jumper, was a natural in one regard: He saw the entire court. He thought of others first, how to make them better, and sacrificed his own game to better theirs. He was the perfect teammate on a team laden with veterans. The ever-brash Cassell broke into the league more than a decade before Livingston and played extrovert to Livingston’s introvert. They once shared the court in a game against Utah. Livingston took the ball out of bounds and nearly drew a five-second violation before signaling for a timeout. Livingston played well entering the 2006 playoffs. He notched 16 points and six assists in Game 4 of the first-round playoff series against Denver. “I felt like I was really just picking the game up and picking and choosing my spots on the court, knowing who was hot,” Livingston said. The Clippers had Phoenix on the ropes in overtime of the second round’s Game 5, but with 1.1 seconds left, Raja Bell tied the game with a 3-pointer, and Phoenix prevailed in the second overtime. The Clippers claimed Game 6, but a rested Nash bullied the Clippers for 29 points in a decisive Game 7 victory. For once, though, the Clippers’ season did not end in bewilderment or disbelief. They had the future. They had promise. They had Shaun Livingston. Shaun Livingston prayed during the national anthem, a message of thanks and a testament to his conviction. He played confidently in the opening moments against the Charlotte Bobcats on February 26, 2007. Just days earlier he’d recorded one of his finest NBA games, racking up a career-high 14 assists against the Golden State Warriors. Livingston played so fast, sometimes Brand wouldn’t have enough time to cross half court before the point guard had risen to score. That February night was no different. But Livingston will torture himself over the next sequence for years. And many will regard it as the most horrific scene they have ever seen at an NBA game. Was there anything he could have done to prevent it? The answer, of course, is no. The mind, though, is always in search of an answer, some reasoning, even if there is none. At one point in the first quarter, Livingston scooped a loose ball off Cuttino Mobley’s deflection and sprinted toward the basket. His long gait carried him there in eight strides. But his momentum took him farther than he wanted and his left foot planted awkwardly. The force of the landing sent his knee in different directions. It looked like someone had thrown a deck of cards into the air. Livingston screamed in agony. Play continued and the rest of the Clippers transitioned back on defense. 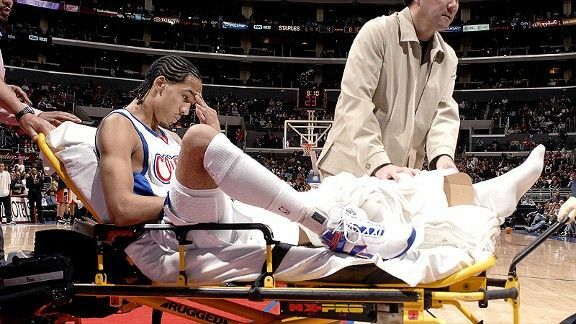 Livingston had felt this type of blinding pain before, when he dislocated his right kneecap and missed the bulk of his rookie season.3 Play stopped and an eerie silence loomed over Staples Center. Brand wasn’t close enough to see the injury, but figured it was serious when he heard the crowd. Cassell, who had a better view, thought Livingston’s promising career had just ended. Dunleavy, from the Clippers bench, immediately knew it was one of the worst basketball injuries he had ever witnessed. Art Jones,5 a longtime family friend who had moved to Los Angeles with Livingston, turned away as he saw Livingston streak toward the other side of the court. By the time he’d turned back to see Livingston slumped on the ground, he figured he’d simply aggravated a nagging thigh bruise. Then his phone started to buzz. Clippers officials wanted Jones to meet them near the court. As he walked closer and noticed the grim faces of the courtside observers, Jones realized, this was no thigh bruise. Wang said the medical technology would not have existed if Livingston sustained the same injury 15 or 20 years ago. “If this would have happened 20 years ago, they just would have told him he couldn’t play anymore and that would have been the end of it,” Wang said. Livingston was taken into the bowels of Staples Center, where he was given X-rays. Jones caught up and remembers being asked to leave the room. He heard Livingston scream and started to pray. An ambulance waited at the loading dock. A stretcher carried Livingston, while Shimoyama ran alongside and continued to apply pressure on Livingston’s knee to keep it stabilized. Jones and JoHan Wang, an associate athletic trainer, waited beside him. Jones asked Wang if the injury was as bad as it appeared. “It’s bad,” he replied. Livingston didn’t think so. It was just a dislocation, he thought. He knew the rehabilitation would involve hard work, but he’d done it before and made it back. He could do it again. Livingston sought affirmation on the ambulance ride to Inglewood’s Centinela Hospital Medical Center. He asked Wang if he had just dislocated the knee. Yeah, it was a dislocation, Wang told him. Wang left it at that, without explaining the severity — he didn’t want the shock and stress of the situation to overwhelm Livingston. They talked about other things on the ambulance ride and maintained a relatively light mood. Looking back on that moment, the tone of Wang’s voice worried Livingston. He realized the gravity of his injury when he arrived at the hospital. A female doctor, Jones said, entered the room. She told Livingston he may be facing amputation. She’d yet to examine him, but after viewing Livingston’s awkward landing on television — announcers warned squeamish viewers to turn away before showing replays — she prepared him for the worst. Wang, Jones said, told him that the doctor displayed unprofessionalism in saying this, whether she believed it or not. Wang asked the doctor to speak with him outside the room because she didn’t want to administer a Doppler ultrasound to assess the circulation to his knee. Livingston eventually left the room for the test. Jones prayed, and while he did, a television in the room showed the replay of Livingston’s injury. It was the first and only time Jones has seen it. He nearly broke down as he waited for Livingston. The ultrasound returned normal. Livingston’s leg would not be amputated, but his career was still in peril. His knee, in shambles, would become a case study for sports-injury professionals. He sustained tears of his anterior cruciate ligament, the posterior cruciate ligament, lateral meniscus, and retinaculum, the tissue that surrounds the kneecap. He tore his medial collateral ligament and dislocated his tibia-femoral joint and patella. “Watching Shaun Livingston blow out his left knee Monday night was the most heartbreaking scene since Bambi’s mother got shot in the meadow,” J.A. Adande wrote later that week in the Los Angeles Times. He faced months of rehabilitation just to walk again — forget basketball, a game as demanding on the knees as any. But Livingston had a plan: avoid negativity. The Lord says protect your eyes, Livingston thought. He passed his cell phone to Jones. He didn’t want to hear from anyone. “What if your grandfather calls?” Jones asked. Livingston toured Duke, North Carolina, Arizona, and Illinois before settling on the Blue Devils. He kept his choice secret for a while, but he hoped that Mike Krzyzewski would integrate him into the offense the same way he had Jay Williams, another talented point guard whose career was later derailed by a horrific injury. Though he’d made his decision, the NBA beckoned. Livingston finished his senior season at the height of the NBA’s prep-to-pro generation. Still, no point guards had ever been selected early in the draft. The NBA preferred big men when projecting long-term. Livingston inquired with the NBA about his draft potential.6 He figured he should at least explore the option. He learned that he ranked as a lottery pick should he declare for the draft. His stock skyrocketed following a workout in front of scouts and executives performed in Chicago by Tim Grover, best known as Michael Jordan’s and Kobe Bryant’s trainer and the author of the forthcoming Relentless: From Good to Great to Unstoppable. Livingston declared for the NBA draft, but that meant he had to make a difficult call to Krzyzewski. Livingston told him that he never would have committed to Duke if he thought he would not attend. Krzyzewski countered that Livingston, in a year or two at Duke, could blossom into the NBA’s first pick. Frank Livingston publicly disclosed his preference that Shaun attend Duke. Frank developed a quick, sturdy relationship with Krzyzewski, believing that the coach’s background of discipline at West Point would benefit Shaun. Livingston flew to Birmingham to visit two of the foremost experts on knee injuries: Dr. James Andrews and Dr. William Clancy performed the reconstruction. Livingston’s range of motion was similar to a 90-year-old the day after the surgery. Doctors flexed his knee that day. One placed a hand on Livingston’s thigh. Another lifted the leg forcibly. “It was almost like watching somebody trying to bend steel,” Jones said. Livingston always knew he would return in some capacity. So did his grandfather. “People ask me that question and I say I expected it,” Frank Livingston said. “I expected him to do well. I don’t expect us to fail. I expect us to do well. 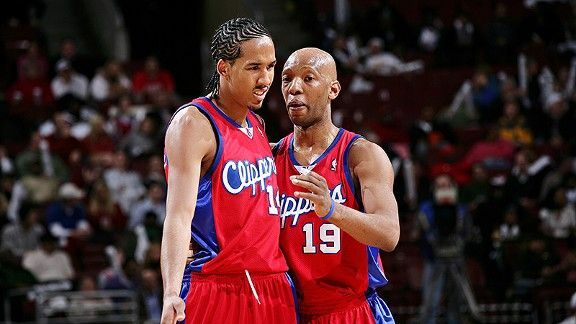 Livingston didn’t return to the Clippers when the team declined to extend a qualifying offer and allowed him to become a free agent. Livingston needed a fresh start after Brand joined Philadelphia in the summer of 2008. His Heat tenure proved short. Miami essentially waived him in trading him to Memphis for additional salary cap room. Memphis immediately cut him. Livingston needed more rehabilitation before another NBA return and joined the D-League’s Tulsa 66ers,10 the Oklahoma City Thunder’s affiliate. Jones is the brother of Verdell Jones, Livingston’s AAU coach. The league maintains an NBA Undergraduate Advisory Committee that delivers evaluations to players and/or their coaches that provide a range of where the player will be drafted should he declare early. Doctors instructed Frank Livingston to return for a colonoscopy every year after his initial cancer diagnosis. “You know what?” a doctor asked him after a while. “We’ve been doing this for 14 years.” After nearly a decade and a half of treatment, Livingston persevered. He was cancer-free. His grandson’s journey, his struggle, is not over. Shaun is in the NBA, yes. The road back proved hugely difficult, a true test of that resolve. He learned to walk again. He learned to run again. He learned to jump again. He learned to play again. But is it enough? So if returning to the NBA and regaining status among the hierarchy of the greatest athletes in the world is the absolute bottom of Shaun Livingston’s expectations, how high is the ceiling? But who can blame Livingston if the thought is eternally planted in the back of his mind? In a game full of landings and liftoffs, cuts and stops, another seemingly innocuous plant could put his career, and possibly his life, in peril. Some question whether it was ever in Livingston’s basketball DNA to play more aggressively. He often deferred to others before the injury. The characteristic makes him an ideal teammate and, at times, limits his game. Art Jones still encourages Livingston every day but reminds him that basketball is what he does, not who he is. Livingston knows all this. The battle is in his mind. The struggle is allowing his mind to trust his body. There is no room for hesitation in the NBA. Kyrie Irving is running circles around the Atlanta Hawks. He’s a blur around the basket, picking and choosing his moments to attack full-throttle. He is potential realized. He is walking the route once mapped out for Livingston. Irving attended Duke and will soon play in his first All-Star Game at the age of 20. During the Cavs-Hawks contest, Irving plays the maestro, guiding Cleveland to its second-largest margin of victory to date. But did you see it? If you blinked you might have missed it. In the fourth quarter, Livingston is a blur as he streaks to the basket for an explosive dunk. Watching that burst, you can’t help but think what might have been. And, if he’s lucky, what may still be.